Siddur Tefillat Yisrael, Sephardi-rite, with laws, piyyutim and supplications. Jerusalem: R. Yisrael Bak, 1842. 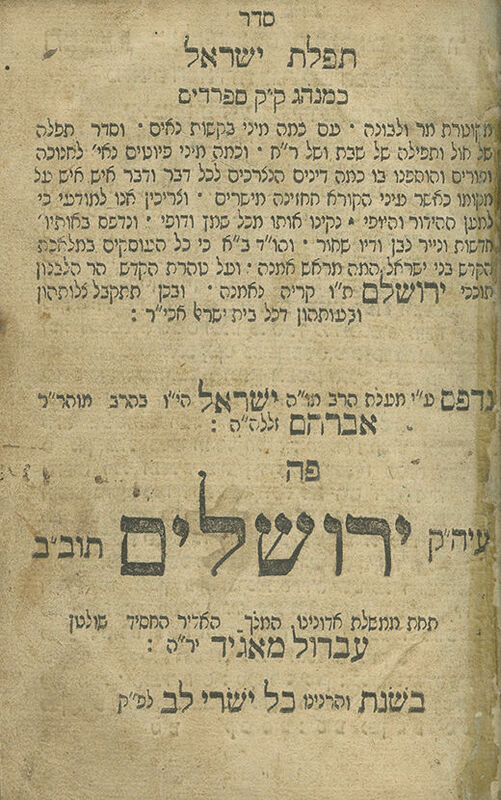 The first Siddur to be printed in Jerusalem. The title page indicates the superiority and holiness of the book, which was printed in Jerusalem, in complete holiness, and "all those involved in this holy production were Jewish". Many approbations from Sephardi Torah scholars of Jerusalem, Safed, Tiberias and Hebron, and from Ashkenazi Torah scholars of Jerusalem (Rebbe Aharon Moshe of Brody, R. Yeshaya Bardaki son-in-law of R. Yisrael of Shklow and R. Moshe Rivlin Doresh LeTzion - the Maggid of Shklow). Included in the approbation of the Jerusalem rabbis is an authorization granting R. Yisrael Bak the exclusive rights to print books in Jerusalem. In his introduction, the printer recounts of his ordeals in the city of Safed: "After all the travails that befell me - pestilence, sword, and hunger… a great earthquake… I was compelled to ascend to the mountain and I have established my dwelling here… Jerusalem". He thanks Yosef Amzalag "who assisted me in printing the siddur". The famous printer R. Yisrael Bak (1797-1874) was a disciple of leaders of the Chassidic movement, Rebbe Levi Yitzchak of Berditchev and R. Yisrael of Ruzhin. Born in Berditchev, he was involved in the printing profession already in his youth, and in 1815, he established the (second) printing press in Berditchev, where he printed some 26 books before immigrating to Eretz Israel. Reputedly, he designed the Slavita typeface. Following his immigration to Eretz Israel, ca. 1831, he settled in Safed, where he established a printing press which operated for a short while, until the great 1837 earthquake which completely destroyed the town (see item 99). In 1841 he established a printing press in Jerusalem – the first printing press in Jerusalem to print Hebrew books and the only press in the city until the 1860s. [Regarding R. Yisrael Bak and his printing press in Safed and Jerusalem, see: Sh. HaLevi, Sifrei Yerushalayim HaRishonim, Jerusalem 1976, pp. 15-27; Meir Benayahu, R. Yisrael Bak's Printing Press in Safed and the Beginning of Printing in Jerusalem, Areshet 4, Jerusalem 1966, pp. 271-295]. 152 leaves. 14 cm. Good-fair condition. Stains, dampstains. Minor damage to several leaves. Margins of several leaves trimmed close to text, slightly affecting text or page heading. New binding. The fourth Hebrew book printed in Jerusalem. Sh. HaLevi, no. 4.